Add a level of quality to your chemical engineering resume. 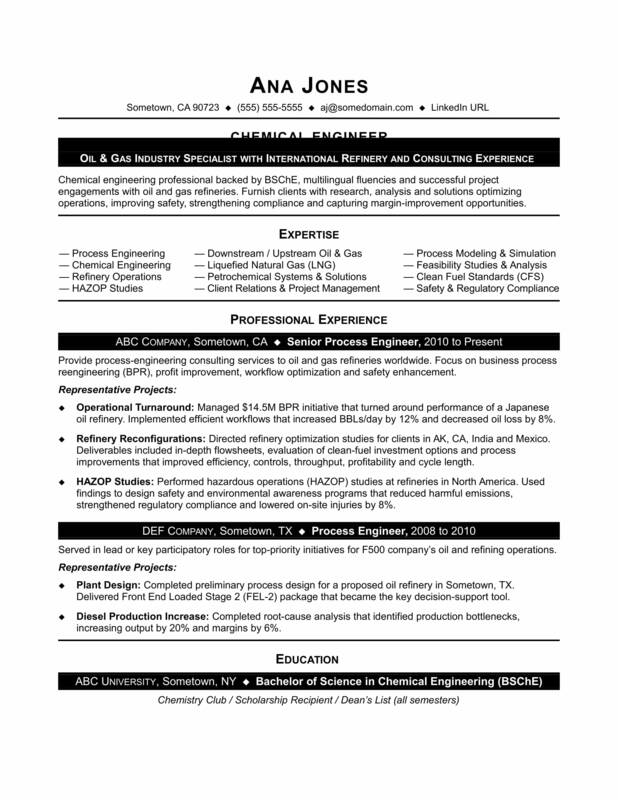 For pointers, view the sample resume below, and download the entry level chemical engineer resume template in Word. And if you need more help, get a free resume evaluation from the experts at Monster's Resume Writing Service. Additionally, you can search for chemical engineering jobs on Monster. Chemical engineering professional backed by BSChE, multilingual fluencies and successful project engagements with oil and gas refineries. Furnish clients with research, analysis and solutions optimizing operations, improving safety, strengthening compliance and capturing margin-improvement opportunities. Provide process-engineering consulting services to oil and gas refineries worldwide. Focus on business process reengineering (BPR), profit improvement, workflow optimization and safety enhancement. Operational Turnaround: Managed $14.5M BPR initiative that turned around performance of a Japanese oil refinery. Implemented efficient workflows that increased BBLs/day by 12% and decreased oil loss by 8%. Refinery Reconfigurations: Directed refinery optimization studies for clients in AK, CA, India and Mexico. Deliverables included in-depth flowsheets, evaluation of clean-fuel investment options and process improvements that improved efficiency, controls, throughput, profitability and cycle length. HAZOP Studies: Performed hazardous operations (HAZOP) studies at refineries in North America. Used findings to design safety and environmental awareness programs that reduced harmful emissions, strengthened regulatory compliance and lowered on-site injuries by 8%. Served in lead or key participatory roles for top-priority initiatives for F500 company’s oil and refining operations. Plant Design: Completed preliminary process design for a proposed oil refinery in Sometown, TX. Delivered Front End Loaded Stage 2 (FEL-2) package that became the key decision-support tool. Diesel Production Increase: Completed root-cause analysis that identified production bottlenecks, increasing output by 20% and margins by 6%.